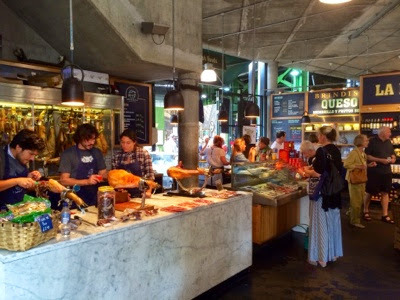 In my recent trip to London, I visited the famous Borough Market. I also learned that most of the stores are open beginning Wednesday through Saturday being more busy and more items on Saturdays - just like any markets I know of. I stopped at the Brindisa stall which sold various Spanish foods. I approached the table where they were slicing the Jamon Iberico. They explained the difference between the Iberico hams and the Serrano which they all sold. After trying some samples I decided to get a little bit for me to take home. It sure makes a good snack without having to go to a wine bar. 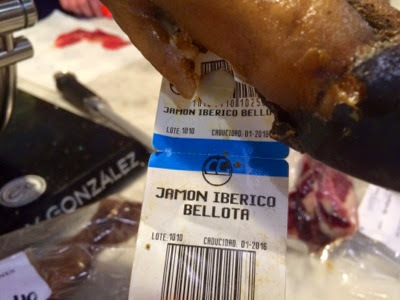 The jamon Iberico Bellota is tender and finer in texture than other Inerico hams I have tried. He explained that they salt the pork and sit for 10 days. They then wash it and let it cure by itself in a special room for pinto 4 years. The process and the feed contribute to it's texture and flavor. 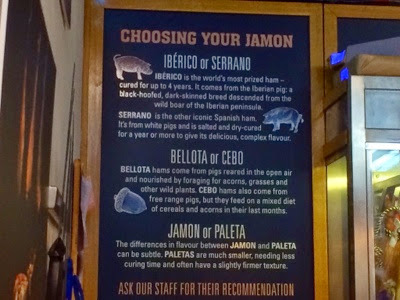 So if you read the board, it explains the differences with Spanish hams.